In the past, I would juice citrus, but I have been eating my citrus lately, which has impressed me with more antioxidants in whole fruit than juice. When i ate a lot of pink grapefruit, I felt my blood sugar lower noticeably, which I don't feel unless I fast. I also never felt that when I juiced grapefruit (along with oranges). Maybe because juice has more calories and fiber in whole fruit prevents over eating. The whole fruit has more phytochemicals though. This reminded me of when a farmer told me his customer was cured of diabetes eating his oro blancos. She came every week and bought a lot from him. Fujioka K, et al. J Med Food. 2006. To study the effects of grapefruit and grapefruit products on body weight and metabolic syndrome, 91 obese patients were randomized to either placebo capsules and 7 ounces (207 mL) of apple juice, grapefruit capsules with 7 ounces (207 mL) of apple juice, 8 ounces (237 mL) of grapefruit juice with placebo capsule, or half of a fresh grapefruit with a placebo capsule three times a day before each meal. Metabolic syndrome parameters were measured at the beginning and end of 12 weeks. After 12 weeks, the fresh grapefruit group had lost 1.6 kg, the grapefruit juice group had lost 1.5 kg, the grapefruit capsule group had lost 1.1 kg, and the placebo group had lost 0.3 kg. The fresh grapefruit group lost significantly more weight than the placebo group (P < .05). A secondary analysis of those with the metabolic syndrome in the four treatment groups demonstrated a significantly greater weight loss in the grapefruit, grapefruit capsule, and grapefruit juice groups compared with placebo (P < .02). There was also a significant reduction in 2-hour post-glucose insulin level in the grapefruit group compared with placebo. Half of a fresh grapefruit eaten before meals was associated with significant weight loss. In metabolic syndrome patients the effect was also seen with grapefruit products. Insulin resistance was improved with fresh grapefruit. Although the mechanism of this weight loss is unknown it would appear reasonable to include grapefruit in a weight reduction diet. In this study, the researchers administrated to one group of mice naringin, a bioactive compound in grapefruit juice that has been identified to induce loss of weight, and another group metformin, a glucose-lowering drug often prescribed to Type 2 diabetes patients. “The grapefruit juice lowered blood glucose to the same degree as metformin,” said Prof. Napolli. “That means a natural fruit drink lowered glucose levels as effectively as a prescription drug,” added Prof. Prof. Napolli. Almost everything morning I have been making grapefruit smoothies for the last 3 weeks. I do remove the seeds first. I prefer grapefruits to oranges and I have been buying many. I take a couple of them and some oranges with me to work just for the juice. Much better than bananas. I will probably die from fruit sugar if Clement is right. But maybe I will go to Hell Heaven. Edited 1 time(s). Last edit at 01/23/2018 03:32PM by RawPracticalist. At the RV park where I stay in Palm Springs for the winter they have Grapefruit and other citrus growing throughout the park which we are free to pick as well as organic dates for sale as the whole park is in an old date orchard. This is my citrus juicer. It's a joy to use. The better the machine, the easier and faster to use. I am eating more citrus but this is how I juice. I live in Palm Springs full time. Would you like to meet? I would like to hear your experiences with being raw. I am transitioning from vegetarian to vegan to raw vegan. Thanks, Tai - I want to get this juicer. I usually buy Whole Foods Fresh Squeezed OJ that you get out of their machine, but I wonder if it's cheaper to make your own. Btw, Whole Foods uses Organic Valencia oranges for their Fresh Squeezed OJ. I want to get this juicer. Congratulations because you will make a lot of juice with this one. I have used many different ones. 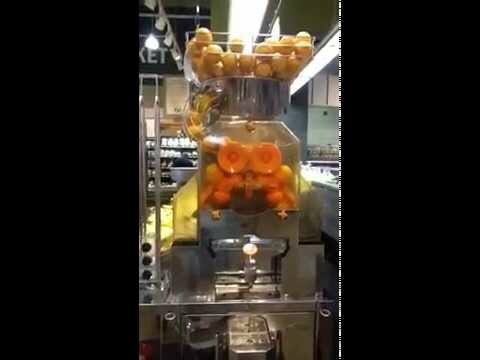 I usually buy Whole Foods Fresh Squeezed OJ that you get out of their machine, but I wonder if it's cheaper to make your own. Hands down, it's so much cheaper. And because it's so fast to make, there is no comparison with the retail price of citrus juice. The juice I buy is the tangerine juice from Trader Joe's which is supposedly unpasteurized. It's like $6 for a half gallon (64 oz). That juice is cheaper to buy than to make. I don't know how they can make it so cheap. I think it's only very seasonal. Sometimes I buy citrus juice from the farmers market when it's made on the spot. Have you ever had a citrus juicer where you didn't have to use your hands to hold the fruit, just press a button or something? What do you do with so much juice when raw fruit juice will have already started to oxidize by the time you get home and that will greatly reduce the shelf life. Edited 1 time(s). Last edit at 02/07/2018 01:03AM by RawPracticalist. Unless a person is a diabetic there is no need for this fixation on lowering blood sugar. There's plenty of borderline and outright hypoglycemics out there who need to bring their blood sugar up and keep it there and I don't mean diabetics who've taken too much insulin. I mean folks at the opposite end of the spectrum. I just tried Cocktail grapefruit for the first time. AMAZING!!! I tried them at the farmers market where they are totally sun ripened and they were one of the best citrus I ever tried. Delectable. Lucious. Mouthwatering. Bursting with surprising sweet goodness. The cocktail grapefruit is actually a blend of a mandarin and a pummelo (or pomelo). The pomelo side presumably gives it that yellow and green color and thick skin, while the mandarin side of its heritage makes it much sweeter than a grapefruit." Let me try to describe the cocktail grapefruit. when fully ripe, the flesh almost falls apart, very different from a pomelo which has thick individual wrapper skin. So when you peel a fully ripe cocktail grapefruit, you have to bite into it like an apple because it's so juicy that the flesh will just fall apart. The white inner peel has a hint of bitterness, which is a faint glimmer of its pomelo origin. It's juicy smooth sweetness indicates there is no citric acid, similar to the sweet lemon. This is my own observation but this must be fact-checked. A high school student in southern Viet Nam has successfully created a medicinal tea from grapefruit seeds and honey which can remove kidney stones. Duong Quoc Trung, an 11th grader from Nguyen Thien Thanh High School in Tra Vinh Province, was awarded the top prize in a science contest held by the province for this creation. The idea came when Trung saw his uncle suffering pain caused by kidney stones. After getting more information about the illness from his mother, Nguyen Thi Nghiep, a general medicine doctor of the Tra Vinh General Hospital, he decided to do something about it. Trung took two hours every day for one year to research his remedy, from June 2014 to June 2015. Starting by reading documents about the illness, Trung found that grapefruit contains d-limonene, a compound which not only prevents kidney stones from forming, but also dissolves them. He then told his uncle to eat the fruit for three months, however it did not work. Trung then surfed the Internet and later found that grapefruit seeds contain pectin which dissolves kidney stones, and is also a diuretic. He decided to blend the seeds into a powder and use them as a medicinal tea. Finally, the remedy worked, the uncle’s situation got better with less pain, although he did get high blood pressure because he lost dietary elements due to the increased urination. Because necessity is the mother of invention, Trung continued to work and soon found that honey could supply the lost dietary elements. So every day Trung asked his uncle to drink two small packs of his mix of grapefruit seed powder and honey. According to Trung, the hardest part was working on the ratio between the powder and honey because the remedy only worked at the correct ratio. After the story of Trung’s remedy spread, many people have asked him for it. Trung welcomes all, with his only requirement being that patients show hospital papers confirming their stones and take an ultrasound two or three weeks after beginning treatment using his remedy. Over the past year, more than 20 patients with stones in their kidneys, ureter, urinary bladder, and gallbladder have used Trung’s remedy for their illness, with 15 of them having their stones completely dissolve and five others having the stones decrease in size. RHB, thank you, that was a brilliant find. I wonder how the grapefruit seed sprout would compare to grapefruit seed powder. Something to try out. But of course, there are a few different herbal formulas for kidney stones. It is fabulous to find use for those precious seeds besides composting them. Tai 30% in Viet Nam are treated by traditional medicine who go to clinics and hospitals. much higher % treated at home with traditionals. My wife was raised in deep country side North, Ninh Binh. People only saw Dr when things got very bad if lucky enough to have a few miserable dollars. Most for many years could not aford Dr. So you learned and passed along traditional med rems. I should spend more time passing along what I hear from these folks. insted of countering the fox moo's propaganda cult. Viet Nam being the poorest contry on earth for many years and a embargo of goods and medicines by the west that ended not long ago to punish them for defeating the worlds stronges Military. Its said here in Country by many the emmbargo killed more than the war. I will make more efort to pass some of what I have been learning along, Wasting to much time ranting at empty chair. In Viet Nam, traditional medicine can be divided into two categories: Vietnamese traditional medicine, which is influenced by Chinese traditional medicine, and oriental medicine. In the countryside and in remote and mountainous areas, Vietnamese traditional medicine is more commonly used. In the delta, lowlands, and cities, patients more commonly use a combination of Vietnamese traditional medicine and oriental medicine. Both Vietnamese traditional medicine and oriental medicine form an integral part of the national health care system in Viet Nam and have an important role in promoting the health of the Vietnamese people, particularly in difficult cases, geriatric diseases, and primary health care at the commune level. Allopathic doctors who have graduated from medical universities and who have been trained in traditional medicine have become some of the most outspoken supporters of traditional medicine. They are actively engaged in promoting the rational use of traditional medicine in their institutes and hospitals (272). According to Ministry of Health statistics, about 30% of patients receive treatment with traditional medicine. Treatment is provided by traditional medicine practitioners (who have not received any formal education) and by traditional medical doctors (who have graduated from a department of traditional medicine at one of the medical universities in Hanoi, Ho Chi Minh City, or Haiphong). There are about 1000 traditional medicine practitioners, 5000 traditional medical doctors, 2000 assistant traditional medical doctors, and 209 traditional medicine pharmacists (272). Additionally, there are approximately 8000 private practitioners of traditional medicine. Of this number, about 1400 are acupuncturists. The Viet Nam Association of Traditional Medicine Practitioners has 24 000 members. Of this number, 461 work in public hospitals. The Viet Nam National Association of Acupuncture has 18 000 members, 4500 of whom work in public hospitals (272). A Traditional Medicine Hospital of the Ministry of Interior Affairs was inaugurated at the end of 1996 (273). Additionally, there are 286 departments of traditional medicine in general hospitals, 45 provincial hospitals of traditional medicine, and four institutes of traditional medicine in Viet Nam (274). There are three medical colleges that have a faculty of traditional medicine, two pharmaceutical colleges, two secondary schools of traditional medicine, two State pharmaceutical companies, two State pharmaceutical manufacturers of herbal medicine, and three national research institutes for traditional medicine (219). An Army Institute of Traditional Medicine was established in 1978, with a staff of 100 doctors and pharmacists. The tasks of the Institute include clinical work, research, training, and the manufacture of herbal products. It serves about 20 000 outpatients and 2500 inpatients each year. The Viet Nam Acupuncture Institute operates under the authority of the Ministry of Health. The Institute is responsible for giving nationwide guidance on acupuncture and other medical therapies that reduce or avoid the use of drugs in treatment. It has 350 beds and serves approximately 2500 inpatients and 8500 outpatients each year. The Government supports public-sector facilities for traditional medicine and encourages people to mobilize resources for the development of traditional medicine, especially for primary health care. Government programmes include training health workers at the community level in using traditional medical methods to treat common and recently defined diseases and encouraging people to plant medicinal vegetables, ornamental plants, and fruit trees. These three groups of plants are intended for use in treating common diseases in the community as well as improving family incomes. This model has become a countrywide programme. A number of official documents indicate clear support for traditional medicine. There is official recognition for a number of traditional therapies, including medications made from plants and animals, massage, acupuncture, acupressure, moxibustion, vital preservation, cupping, and thread embedding. Article 39 of the Constitution of the Socialist Republic of Viet Nam outlines State undertakings to develop and integrate allopathic and traditional medical and pharmaceutical practices as well as to develop and integrate official health care, traditional medicine, and private medical care. More detailed provisions on traditional medicine can be found in a 1989 public health law (275) and 1991 regulations made under it (276). Among the objectives of health care, Section 2 of the 1989 law lists the development of official Vietnamese medicine on the basis of traditional medicine and pharmacy and the integration of allopathic and traditional medicine. The promotion of these objectives is the shared responsibility of the Ministry of Health, the Vietnamese Traditional Medicine Association, and the Viet Nam General Union of Medicine and Pharmacy. Under Section 34.1, these organizations are additionally charged with ensuring conditions for the operation of all major hospitals and institutes of traditional medicine. Section 34.2 provides that the medical services and the people's committees at all levels are to consolidate and broaden the health-care network using traditional medicine. Section 35 permits licensed traditional medicine practitioners to practise in any State, collective, or private health care institution. This includes acupuncturists who have been trained, who have attended courses in traditional medicine, or whose knowledge of traditional medicine was passed down to them through their family. Traditional medicine practitioners may examine and treat patients as well as offer preventive advice. However, before new treatment methods can be used, they must be approved by the Ministry of Health or provincial health office and the Traditional Medicine Association. Superstitious practice is forbidden by Section 36. Private practice of traditional medicine is subject to management by the Government and the Ministry of Health. The 1991 regulations specify required qualifications for traditional medicine practitioners as well as the permitted range of procedures practitioners may use. A breach of any of these rules that results in serious harm to life or health of another person is punishable under the Criminal Code by imprisonment (277). The 1993 Vietnamese Ordinance on Private Medical and Pharmaceutical Practice (278) includes detailed provisions on the private practice of traditional medicine. The Ordinance permits certified practitioners of traditional medicine to privately practise the range of activities for which they are certified, provided they have a permit to do so and subject to State overview. Article 5 lists permitted activities as including practice in a traditional medical hospital or clinic and providing traditional forms of treatment such as acupuncture, massage, acupressure, and herbal saunas. Article 7 requires traditional practitioners to hold a diploma of Doctor of Medicine or Assistant Doctor Specialising in Traditional Medicine and to have practised traditional medicine for a minimum period that varies between two and five years. A number of measures are included in the Ordinance to further safeguard patients' interests. Under Article 17, practitioners must put up a name board that sets out the activities they are permitted to practice. Private practitioners must obtain the permission of the Ministry of Health to use novel treatment techniques or drugs. Superstitious practices are not permitted according to Article 19. Private practice without a certificate or practice that exceeds the range of permitted activities is subject to administrative, disciplinary, or criminal sanctions under Article 34. The Government entrusts the health service system with issuing licences to traditional practitioners through an assessing committee. Anyone who has 13 certificates issued by an assessing committee and the Ministry of Health can privately practise traditional medicine. In the area of acupuncture, the regulatory qualifications of practitioners include Professor, Associate Professor, PhD, Acupuncture Speciality Doctor Level I, Acupuncture Speciality Doctor Level II, and Acupuncture-Oriented Doctor. The Ministry of Health advocates socialization and diversification of traditional medicine. There is no college or university of traditional medicine in Viet Nam. Although Hanoi Medical University has a department of traditional medicine, it does not meet the needs of developing traditional medicine in Viet Nam. Two secondary schools are the main seats of learning in traditional medicine. There is strong support for a facility of higher education in traditional medicine, and the Government is planning to create a university of traditional medicine to provide programmes for secondary, undergraduate, and postgraduate study (278, 279). wow that was eye-opening. I never knew that about Vietnam. I would love to hear more about the folk medicine there how it combines Chinese medicine and local knowledge. It must be amazing with all the exotic fruit there. I kept hitting the button while my internet was not responding. Sorry for duplicate postings. The best I can do is delete content but not post. Edited 1 time(s). Last edit at 04/05/2019 02:25PM by Tai. Edited 1 time(s). Last edit at 04/05/2019 02:26PM by Tai. Edited 1 time(s). Last edit at 04/05/2019 02:24PM by Tai. Edited 1 time(s). Last edit at 04/05/2019 02:23PM by Tai. Edited 2 time(s). Last edit at 04/05/2019 02:27PM by Tai.